Parents, are your children/teenagers confident about making sensible choices when away from home? Life is about choices. Parents, equip your children/teenagers to know how to consider the advantages and disadvantages of their choices. If your teenagers are saying nothing is going right in their lives, this may be because they don’t stop and think about their choices. Choices usually turn into actions and they need to appreciate how to take charge of their choices before taking avoidable actions. 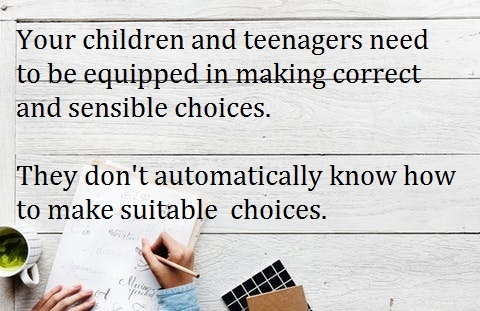 Parents cannot expect to make choices for their adult children… Instead, parents need to train their children/teenagers from a reasonable age so they can acknowledge the importance of making suitable choices on their own. Why can’t children/teenagers just know how to make the right choices? Their experience of life is limited. Why do they seem to choose the wrong choices more than the correct choices? Peer pressure has a remarkable influence over the choices they make and if they have not been trained by their parents, who knows what they will choose? There needs to be an understanding between the parents and the family about the difference between choices which lead to big issues and choices which lead to small choices. Big issues are serious and can form a ‘ripple effect’ in the children/teenagers’ lives from one simple choice which turns into a nasty action. Big issues include using any addictive substances, even cigarettes, stealing, lying, cheating in tests and becoming sexually active when not responsible and emotionally ready. (Please negotiate your own system on what you consider big issues with your children/teenagers. If the children/teenagers don’t know what choices are acceptable and unacceptable it will be difficult to suddenly hand out consequences. Parents, don’t assume they know the difference … TELL THEM! How do parents start getting their children/teenagers to make sensible choices the first time around? Discuss any previous impulsive choices which led to undesirable actions without digging up skeletons. Allow your children/teenagers to have time to think about why they made certain unwanted choices without becoming angry again. Ask them to give you suggestions of beneficial choices which they could have taken. GIve them opportunities to explain, in discussions, what choices they have in mind before making them. Explain that you are going to need to assist them in making choices because you are responsible for the consequences!